The people of Chad are going to the polls to vote in presidential elections with incumbent President Idriss Deby expected to win a fourth term. The main opposition figures are boycotting after their demands for electoral reform were not met. There are concerns that the boycott could affect voters turnout. Mr Deby, who has faced two attempted coups since the last polls, has recently mended relations with Sudan, where rebel fighters were based. The BBC's former correspondent in Chad, Celeste Hicks, says this has helped to restore security and it is significant that Monday's election is taking place in relative peace. Chad became an oil-producing nation in 2003, but remains one of Africa's poorest countries. Mr Deby is facing two challengers: a lawyer, Nadji Madou, and a former agriculture minister, Albert Pahimi Padacke. However, both are relatively unknown. Many voting stations in the capital, N'Djamena, opened late because of the late arrival of voting materials and staff, the AFP news agency reported, quoting witnesses. For many Chadians, Monday's election is a foregone conclusion. With three of the most popular opposition politicians not taking part, it seems unlikely that Idriss Deby will face much of a challenge from the two candidates who are standing. Nadji Madou is a newcomer on the scene, a wealthy lawyer from the south; he may hold some appeal to younger voters, but lacks political experience. 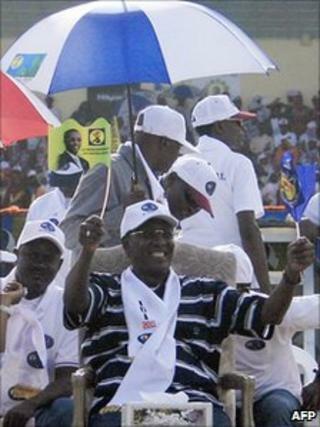 Albert Pahimi Padacke has a longer political career, but most of that has been as a minister in Mr Deby's government. The apathy evident in some voters seems in part to spring from disaffection with February's legislative elections which many feel were badly organised. The rest is frustration with an electoral system that has consistently failed to offer real choice since Chad made the transition to multiparty democracy in the late 1990s. Although President Deby will feel that he has shown Chadians the benefits of his 20-year tenure, including oil income spent on new hospitals, roads and schools - and perhaps more importantly bringing an end to the disastrous rebellions sponsored by Sudan - Chadians' real feelings will emerge when its known how many of the 4.8 million registered voters actually turn out. Three of Chad's more prominent opposition figures, Ngarlejy Yorongar, Saleh Kebzabo and Wadal Kamougue, pulled out of the race after a list of demands to improve the electoral process was not met. Most serious of these was a request to reprint voters cards, after Mr Kebzabo found a number of pre-dated cards on sale in N'Djamena's main market. Some results from recent legislative elections were also annulled after the country's constitutional court found irregularities. A coalition of rebel groups has also called on people not to vote, describing Mr Deby as the "Sultan of Chad". He has been in power for more than 20 years after seizing power in a military coup, and changed the constitution in 2004 to scrap the two-term presidential limit. Attempts by other African leaders to stay in power for more than two terms have proved unpopular - in neighbouring Niger the president was last year ousted by the army after he tried to extend his rule. Since Chad's last elections rebels have twice travelled 1,000km (about 600 miles) from the east to the capital to overthrow Mr Deby, angered by his decision to change the constitution. They were supported by the Sudanese government, which was unhappy with Darfuri rebels taking sanctuary in the east of Chad. A rapprochement between Chad and Sudan in 2010 has helped bring peace to the region.